JR East class 205-3100 EMU. The train consists of 4 cars of which 2 are motorized. There are two trains, the Mangattan liners that are painted with famous manga figures. When this train is used as an express train on the Senseki line, manga stories will be read for the travelers through the PA system. 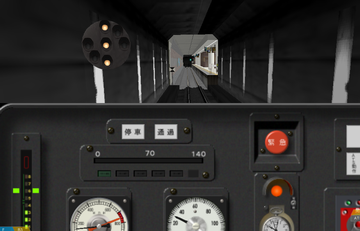 Photorealistic driver's stand with speedometer, manometer (pressure gauge), clock, pilot lamp, and indication lamps for the braking system.